Originally built in the 1990s but renovated on multiple occasions since then, Teddy Stadium is home to four of Israel’s most loved football teams: Beitar Jerusalem, Hapoel Jerusalem, Hapoel Katamon Jerusalem and Beitar Nordia Jerusalem. The 31,733 capacity venue has also been used to stage large-scale entertainment events. For the latest phase of the venue’s audio evolution, Tel Aviv-based professional audio distribution and production specialist D-AND-D was asked to supply a multi-function PA/VA loudspeaker system that would be capable of delivering crystal clear audio throughout the venue, whose capacity was increased to its present total with the addition of a new south side stand in 2013. The system needed to accommodate standard stadium visitor and commercial messaging, as well as communications in the event of an emergency. The final design features a grand total of 114 Electro-Voice EVH-1152D premium 2-way coaxial horn-loaded full-range loudspeakers. 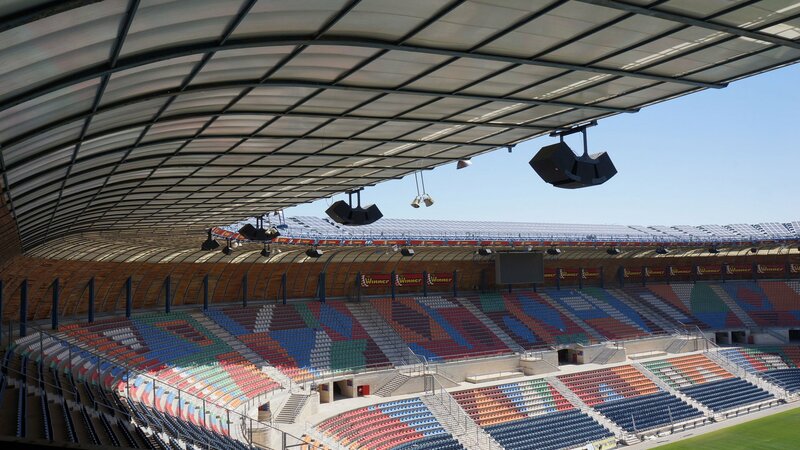 Each incorporating a 3-inch DH7N titanium/neodymium HF compression driver, rotatable constant-directivity waveguide, and pattern control maintained down to 500 Hz, the EVH-1152D speakers are specifically designed to suit inherently reverberant spaces such as stadiums.